My work Christmas 'do' is fast approaching and when a say a bit of a do I really mean it!! Nothing fancy....no frills just a meal straight from work (no turkey even, I'm having fish & chips!!). This presents me with the usual problems.....what the hell to wear?!! There won't be time to get really dolled up and in my place of work.....well it's all pretty casual!! I do want to make a bit of an effort as there really aren't to that many reasons for me to do so these days!! Luckily the staples that I tend to wear to work are some black skinny trousers from Gap, worn with black suede dicker boots which I think you will agree is a pretty good foundation to start off with!! Now, I don't like to be cold so I've started by looking at sweaters. 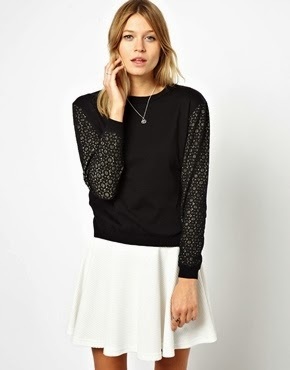 The great thing is with a sweater even if it's a bit glitzy you can still get away with it during the day!! You can bling it up with some fab statement earrings for an evening out but really tone it down with boyfriends jeans and trainers for day to get maximum usage out of it!! Well that's my plan should I go down this road! And the thought behind this....obviously came from Pinterest although the boyfriends are sadly paired with these lovely heels that really have no place in my life at the moment! As it's Black Friday whilst I type this, there are some amazing discount deals to be had so here I am starting with a few budget busting items (thank goodness there is only another month of my challenge to go!!). 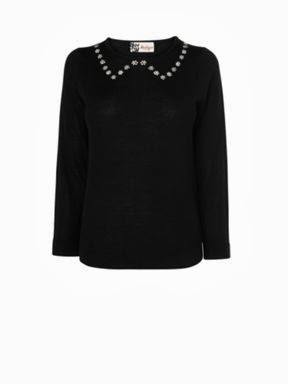 Feeling a lot of love for this Boutique by Jaeger jumper too! 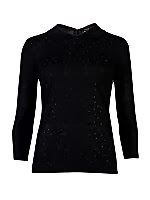 As House of Fraser have such great deals over the next couple of days I have also had my head turned by this lovely little Therapy sequin knit jumper. 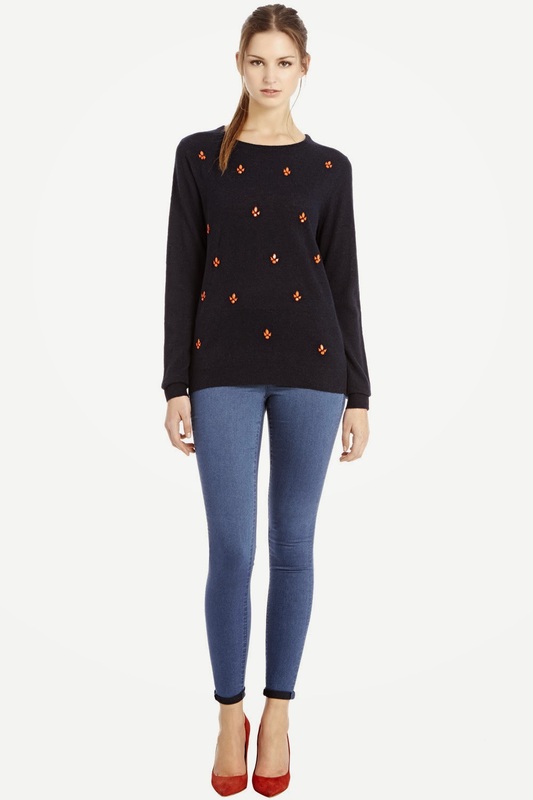 Moving on....this Warehouse sweater features a titchy bit of colour in the way of some orange sparkles! 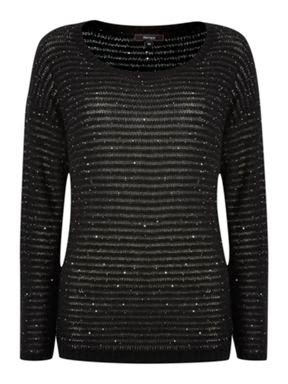 Or there is always the Lipsy Chiffon Back Sequin Jumper just gorgeous! H&M have totally come up with tons of my wardrobe staples this season, this addition would be no exception! Lastly......just throwing a total spanner in the works! I have had a hankering for a fur gilet which I was thinking I could wear over an existing black Gap crew neck sweater with a statement necklace, obviously something I could style loads of other different ways....not just for a Christmas do! If I can hunt down this beast in New Look over the next few days....well it will do nicely! To finish off, here are my outfits for the past week....eek! Must apologise for my lack of posts lately! I blame some extreme lethargy.....or maybe it's been down to a marathon of Breaking Bad seasons 1-4, downing at least 2 episodes per evening!! Anyone else addicted to this show?? Gosh, it's so bad it's good right??! First outfit was from Saturday and 'twas the usual shirt and sweater combo....my favourite as it happens!! Primark bobble hat, great for 3 quid if you are prone to losing these things like me! Wednesday's offerings, I was really not doing that much! So there we have it! What say you??!! Do you have a big Chritmas 'do' to go to or is yours rather more subdued like mine? Would love to hear what you will be up to and most importantly what you will be wearing! Oooh, would budget allow for BOTH the Lipsy jumper and the gilet? can't decide between them .. and I love them both! Breaking Bad - BEST THING EVER - I totally loved each and every episode from all the series .. I miss it. I LOVE that cream jumper over the shirt .. stealing that look! 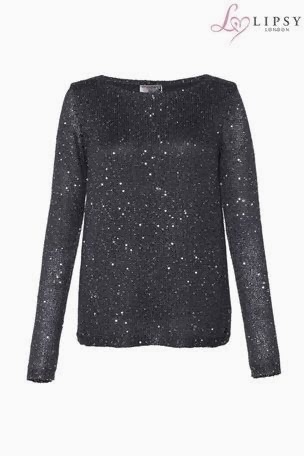 Topshop have some amazing jumpers with sparkly shoulders that I love at the moment. Hey Sharon.....I am on the case with the gilet as we speak! I think it will slot into my wardrobe just perfectly and your right it is something that will take me from season to season! Vikki......if you after the black gilet keep checking online as I spoke with New Look and they said bits and pieces will keep coming through! I will warn you it comes up very small! I am a size 8-10 on top and in order to wear it over a jacket I'm going for a size 14! !